Recreate a Delicious Mrs. Knott's Chicken Dinner- at home! Our love for Knott's Berry Farm has grown so much over the past year, we have made so many memories as a family and I am so glad to be able to share them with all of you, my readers. As much as we love celebrating the holidays and seasons with Snoopy and the Peanuts, my goal is to encourage you all to visit with your families to make your own Knott's Berry Farm memories. Recently, my love for Knott's has taken me out of the park and into the surrounding shops located in Knott’s California Market place. Last week I spent an hour wandering around Berry Market dreaming up some recipes that would be perfect for the upcoming holidays. 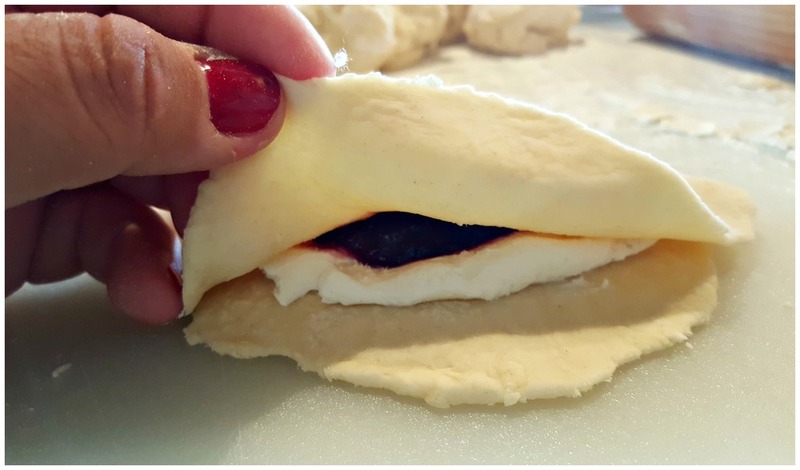 Today I am sharing TWO recipes with you, Boysenberry & Cream Cheese Empanadas and Boysenberry BBQ Meatloaf. Although technically I could bake empanadas year round, I usually save them for the Winter. There is something about having your very own pie with a warm cup of coffee or showing up to a party with a tray of empanadas that is just perfect for the holidays. While perusing the aisles at Berry Market I came across my favorite Knott's Berry Farm Biscuit Mix and Berry Market Boysenberry preserves and one thought came to mind: empanadas. 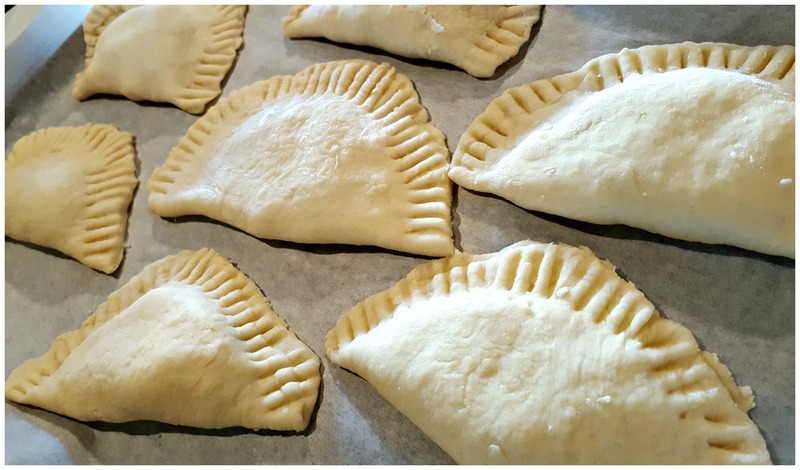 This recipe yields one dozen empanadas. Preheat the oven to 400 degrees and prepare the pan with parchment paper. Make the dough: Follow the instructions on the Knott's Biscuit Mix package. The recipe calls for 2 cups of mix to 2/3 cups of water. Follow instructions for the roll out dough and knead the dough on a floured surface. Separate the dough into 12 - 1 1/2 inch balls. Roll each ball of dough to a 1/4 inch thick circle with a 3 1/2 inch diameter. Spread 1 tbsp of cream cheese on half of the dough, making sure to stay about 1/2 inch from the ends. Top the cream cheese with 1 tbsp of Berry Market Boysenberry Preserves. Fold half of the dough over the other half to form a semi circle. Use a fork and press along the edges of the empanada to close. Pop the egg yolk and use a brush (or your fingers) to spread some yolk over the top of the empanada. Sprinkle sugar over the top of the empanada. Not only did I fall in love with Knott's Berry Farm's Berry Market for my own personal recipe ideas, I was super excited to find so many gift ideas. My favorite types of gifts to give (and receive) are gift baskets filled with items that will last you longer than one day. Berry Market has so many different items that can be put together to make the best gift basket. I fell in love with all of the dry mixes. They had every flavor you could think of in these super cute packages. See the carrot cake muffin mix above? Adorable. Berry Market is definitely known for their many flavors of preserves, but you will also find really pretty and unique kitchen items as well as your choice of fresh fudge and coffee made right in store. If you will be visiting Knott's during #MerryFarm make sure to stop by the Berry Market and make some gifts off of your list. If you will be missing Knott's Merry Farm this year, don't worry, Knott's Berry Market has an online store. You can purchase your favorite Peanuts stuffed plush characters, Jams, Syrups and Seasoning Mixes in time to make your holiday gift baskets.